When in Manila, it’s often a strain trying to catch up on your day-to-day-to-do list! Not to mention day-dreaming about your plans over the weekend… so powerful they keep your mind wandering and by the time you get home, you realized you forgot that you’re in-charge for dinner! Uh-oh… Panicky..? Not anymore! All you need is grab your phone and dial 789-9999! In less than 30 minutes, you and your family would be devouring on Mrs. Hudson’s Pizza! Does the story ends there? Na-aah… I just mentioned “Mrs. Hudson’s Pizza”! Right. Just when we thought we already had all the Great Pizzas Yellow Cab has to offer, they suddenly elevated that experience through Mrs. Hudson’s Pizza, the FIRST-EVER SAUCE-LESS PREMIUM PIZZA. Another New York-style pizza suggestive of Italian inspiration, referencing the historic Hudson River of New York City and Sherlock Holmes’ landlady, Mrs. Hudson – of 221 B, Baker Street, first encountered in The Study in Scarlet – boasts of freshness and unique take on this comfort food favorite. Mrs. Hudson’s Pizza! Yellow Cab’s first-ever sauce-less pizza! What made it more mouthwatering when I set eyes on Mrs. Hudson’s Pizza, are the luxurious toppings of PROSCIUTTO, also known as PARMA HAM AND IS AN ICONIC ITALIAN DELICACY: thinly sliced, uncooked dry-cured ham with a sophisticated salty flavor. However, the vision of BOURSIN CHEESE would not escape my sight. It’s herbed, soft and creamy in texture. Those two indulgent elements alone should satisfy one’s palate but YELLOW CAB PIZZA Co. simply wants to give us more than we could ask for by pairing those garnishes with caramelized onions, tarragon, and other premium cheeses infusing a subtle sweetness in the pie which resulted to a wonderful blend from two opposite ends of the flavor spectrum. Contradictory taste sensations that very well stand out on their own, hence eliminating the need to add pizza sauce! …while some-one couldn’t help but be a little sneaky! Second slice…? Third maybe…? 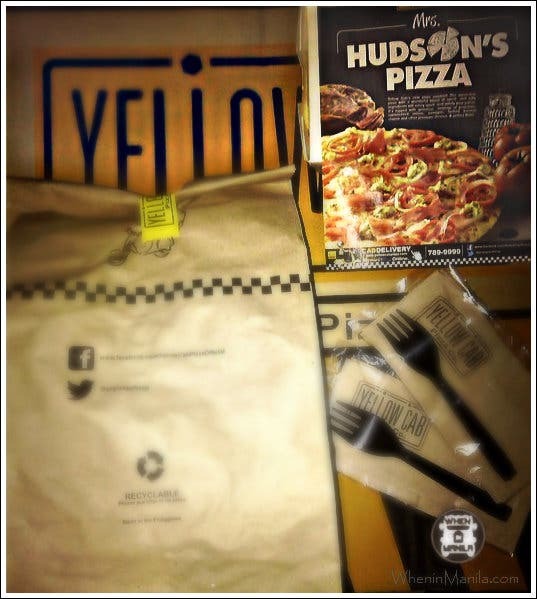 In case you are still wondering what to have for dinner, keep in mind Yellow Cab Pizza Co. is only a phone call away, when in Manila or even outside the city. You can call them now and call them fast because Mrs. Hudson’s Pizza is a sauce-less pizza and is a LIMITED-EDITION OFFERING AVAILABLE UNTIL JUNE 30, 2013 ONLY! 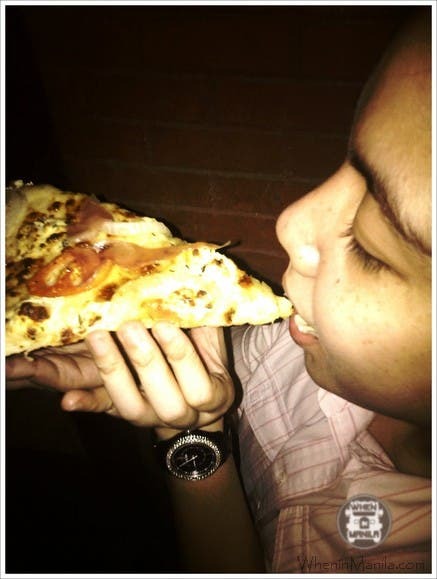 follow Yellow Cab on twitter at www.twitter.com/ycpizzaofficial for more information. 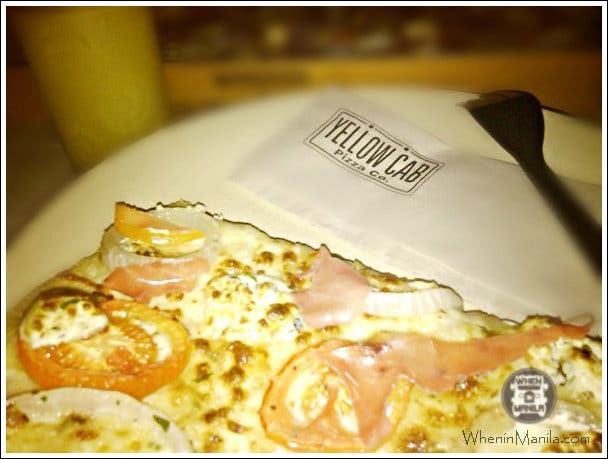 For 24/7 Great Pizza delivery, call 789-9999 or www.yellowcabpizza.com to order online. Grand Meré Restaurant in San Juan can cover your events and party needs! The BIG BANQUET: The Top Caterers in Manila All Under One Roof! 12 of the cheesiest food you can eat in Manila!